The program begins in the morning with circle time. The children review the days of the week and the months of the year. The teacher presents new materials to the children. The teacher then dismisses each child and asks him/her to select a material from one of the curriculum areas throughout the classroom. At around eleven, the children return to circle time for get ready and then go outside to the play yard for about forty-five minutes and come back. At noon, the children have lunch followed by a nap from 1:00 pm – 3:00 pm, they get ready for snack and then go outside to the play yard for about thirty minutes and come back. The afternoon ends with the children’s dismissal. 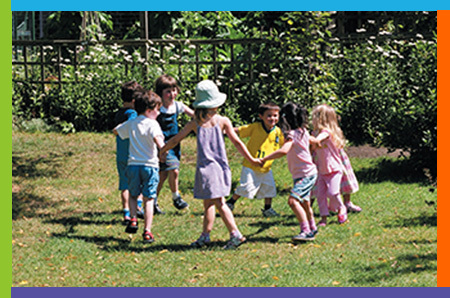 This program begins when the child arrives at school at 7:00- 8:30. The child selects an activity from the art materials and games till 8:30. The Sensorial area is designed to isolate specific attributes of a material, such as thick and thin, large and small, long and short and to order the varying degrees of each. 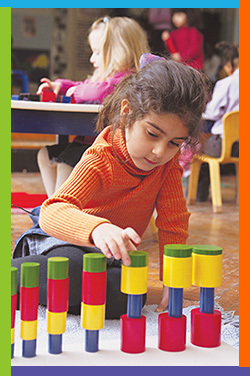 It is through the children’s work with these Sensorial materials, that their senses are awakened. 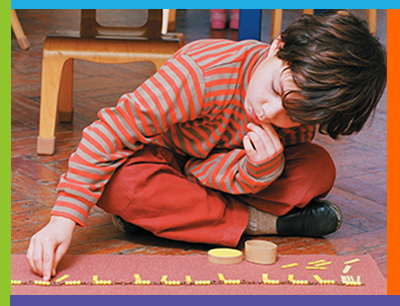 Dr. Montessori observed that it is through the education of the senses that the child begins his/her journey to create the adult he will become. Rather than learning math facts by a rote method, there are many beautiful and concrete math materials in the Montessori classroom. They are designed to attract the child to experience abstract concepts through the manipulation of these concrete materials. We begin with the quantities of 1-10. As the child masters these concepts, the teens and tens are introduced along with the basic operations of addition and subtraction. The next level of activity is the introduction to the decimal material. There are two areas of the Language curriculum: pre reading/reading and writing. The sandpaper letters are used to introduce the sounds the letters make and the moveable alphabet is used to build and decode words. The children are introduced to the sounds the letters make as opposed to the names, because that’s how we read. The entire classroom is ultimately a language learning experience. We explore many lands…their customs, language, food, dress, music, etc… As young scientists we observe with wonder the world around us including plants, animals, land, sky and our great big vegetable garden!